Will Hutchins on the making of Shootout at the Red Dog Saloon in Pioneertown for Janpanese TV, the art of Charlie Robertson and Elvis in Harum Scarum. Back in ‘93 Babs and I moseyed on down to Russell “Lucky” Hayden’s Pioneer Town in the Southern California desert to work on a sci-fi western for Japanese TV, “Shoot-out at the Red Dog Saloon”. Christopher Coppola was the feller who shouted “Action!” Perfect setting. You had your basic cowboy street, and just yonder were endless rows of sky-high windmills that looked like monsters from outer space come to get us. I played a goofy sheriff, Bumbalo Bill. I “borrowed” some sight gags from Lash LaRue’s sidekick, Al “Fuzzy” St. John. My sidekick, Michu, was a midget who ran away from the circus and joined our show. He was the world’s shortest Hungarian. He rode a full-sized hoss. I rode a teeny Shetland pony. How teeny? When I climbed on, my boots touched the ground. I’d call that teeny, wouldn’t you? Babs was chief choreographer. She devised a few snappy steps for Michu and me, similar to Laurel and Hardy’s dance in “Way Out West”, although, I must say, Laurel and Hardy had happier feet. The villain in our sagebrush saga was one of my favorite actors, Clu Gulager. Our shootout was rather unique. Clu pulled his pistola—before he could pull his trigger I went into action, resorting to chemical warfare. The striped trousers of my classy action suit ballooned—Ka-Boom! Said trousers exploded! Clu was aghast! He let out a wheeze, turned green, and vanished in a cloud o’ dust, jes’ like the wicked witch of the west. Comes the climax—all the ET baddies got spaced-out to a galaxy far far away. My loyal sidekick Michu rides outta town on a tumblin’ tumbleweed. The townfolks shun me. Even my trusty steed bucks me off. Wistfully, I toss my badge onto the dirt and trudge off into the sunset. (Actually, the sunrise—we shot at dawn). Well, we didn’t win any Japanese Emmys for that puppy, I can tell ya. Duke Wayne was once engrossed in a game o’ chess on a cramped soundstage in Durango, Mexico. The barroom was being lit for the derigueur brawl. ‘Twas hot ‘n humid, barely enough room to laugh horizontally. The director shouted in Spanish for the tourists and other visitors to clear the building. Nada. The assistant director shouted louder. Nada. Ditto the second A.D. Ditto Nada. The Duke sized-up the situation, put down his bishop, stood up to full cowboy, and thundered “Vamoose!” And with one mighty wave of his arm the interlopers skedaddled. Sorta like Moses parting the Red Sea. Talk about your star power. Know who else has star power? Jeff Bridges, that’s who. Remember him in ‘72’s “Bad Company”? I sorta do. Let’s see, Jeff and his pal o’ the saddle are punk kids, robbin’ ‘n russlin’, followin’ the outlaw way, headin’ west, far away from the Civil War. Every mile is a place they’re never been. By chance, they meet-up with the mother of all bandits, David Huddleston, and his gang of ornery hombres. They’re lusty, they’re crusty, they’re saddle sore. Jeff and pard join forces and leave their sappy dream behind like road kill. I’d like to see “Bad Company” again. Memory plays funny tricks. 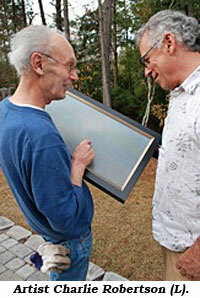 Our onetime next-door neighbor, artist Charlie Robertson, is a premiere master of encaustic paint. Dating back to classical Greece, encaustic paint is made from wax and resin. It may well be the most beautiful, versatile, durable of artists’ paints. Charlie thinks it is. The night I received my Golden Boot out in La La Land one of Charlie’s paintings was up for bid in a silent auction. I wrote $100 and forgot about it. I was all afret about my impending speech. Morgan Woodward won the treasure. One cold, late autumn morn on our street all was quiet, save for the mournful wail of the day’s first train into the Big Apple. Charlie stood in front our old red farmhouse, Limberlost, and sketched it. Three of Charlie’s encaustics are prominently displayed on our wall including Charlie’s wonderful Christmas present, his depiction of Limberlost. It glows, pulses, breathes—maybe we should feed it. I don’t know much about art, but if Limberlost ever catches fire, I’ll make sure Babs and our cats are safe outside, then I’ll run back in and rescue Charlie’s paintings. Elvis Presley once told me that “Harum Scarum” was his least enjoyable flick experience. “Jungle” Sam Katzman made him perform all his own stunts. 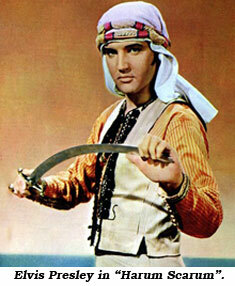 Elvis said the sword fighting called for more rehearsal. Sam shouted, “Time is money!” Elvis collected his fair share of sword conks on his knuckles—ouchville! Where was the Colonel when Elvis needed him? Legend hath it that Leo Gorcey refused to do his own stunt in an Eastside Kids epic. “Jungle” Sam rushed to the set, “Come on, Leo, be a sport. The budget won’t allow a double. It’s just a simple, garden variety fall down a flight of stairs. They’re padded. Come on, tuck and roll!” This time Leo shouted—“No way!” and he stormed off the set. Later, Huntz Hall knocked on his dressing room door. “Leo, come on back. You gotta see what’s going on. You’ll never believe it!” Reluctantly, Leo snuck back onto the sound stage and stood back in the shadows. Now, the director shouted. “Rollem!” There, at the top of the stairs in Mugg’s costume was “Jungle” Sam Katzman in person. “Action!” “Jungle” Sam took a deep breath and then proceeded to tuck and roll all the way down the stairs and into motion picture lore. When you get right down to it, life is silly. Laughter is the best medicine. Every night just before slumbertime I make Babs laugh. Then I put my pajamas back on.